I think I am addicted to eggplant, not only is it good for you but this recipe (another one from Masterchef) is full of flavour. You don’t have to use the cheese if you’re not a fan but in my book it adds so much taste. Easy to make and always so very colorful for any occasion. 1. Brush eggplant with butter and cook under a hot grill or on a grill plate until golden and cooked. 2. Combine Ricotta , Parmesan, parsley, egg and seasonings. Top each eggplant slice with prosciutto. Place tablespoonfuls of cheese mixture along the narrow edge of the prosciutto and roll up to resemble cannelloni. 3. Place rolls in a buttered 25cm x 30cm baking dish. 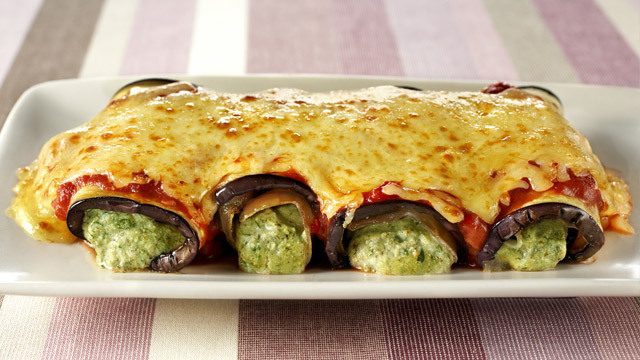 Pour tomato sauce over eggplant rolls and sprinkle with Pizza Plus. Bake at 180°C for 45-50 minutes or until cooked and golden. Serve with crisp salad and crusty bread. This entry was posted on August 24, 2010 at 7:21 am and is filed under Cooking, Family, Friends, People, Random, Recipe. You can follow any responses to this entry through the RSS 2.0 feed. You can leave a response, or trackback from your own site. This one really looks tempting. I like eggplant and cheese and eggs. Yummy. Thanks for sharing. Oh yes, this one is just for me! this is cute and fun item..
love the freshness and creativity in your work. Brilliant! I do love the idea of using eggplant in the place of noodles … yummy, low carbs, and people with Celiac can eat it. What more could we want. Thanks for this, my friend.